Ballot drop boxes: Will convenience get you to vote? The crucial question is whether or not additional ballot boxes actually lead more residents to vote. Or do they merely divert ballots otherwise headed to the postal service? DESPITE the importance of the last presidential election, voter turnout was typical: four out of 10 Washington residents eligible to vote did not. Interest in the use of drop boxes as alternatives to the U.S. Postal Service peaked last month when Gov. Jay Inslee signed a bill requiring counties to install 250 to 275 additional boxes throughout the state. Katie Baird and Will McGuire are economists at the University of Washington Tacoma. Loren Collingwood is a political scientist at the University of California Riverside. Drop boxes are preferred by some voters, and this new law will make them more popular still. 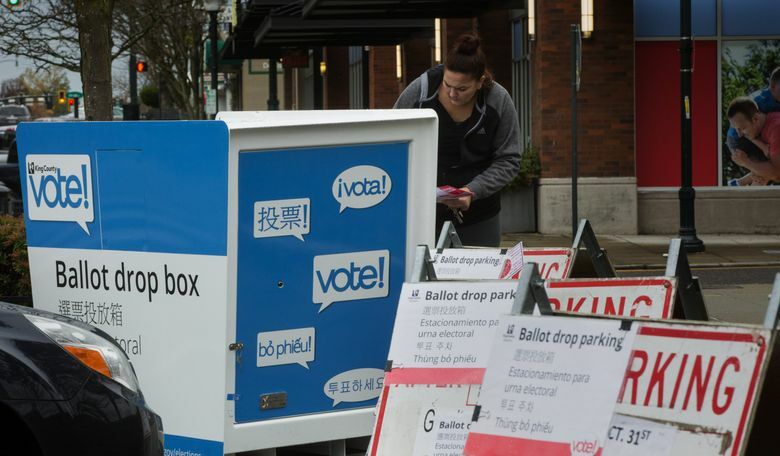 In King County, one-fourth of all voters used a drop box before last summer’s expansion; after it, more than half did. Under our state’s new law, King County will now double the number of drop-box locations. The crucial question is whether or not additional boxes actually lead more residents to vote. Or do they merely divert ballots otherwise headed to the USPS? The three of us, along with Sarah Hampson of the University of Washington Tacoma, and Ben Gonzalez-O’Brien of Highline College, were interested in this question. Working with King County Elections, we studied the relationship between a voter’s distance to their nearest drop box and the likelihood they voted in the 2015 and 2016 elections. We found that installing more drop boxes does increase voter turnout, but the effects differ by demographic group and type of election. For instance, in November’s general election, people living three to 10 miles from a drop box were as likely to vote as were those living next door to one. This makes sense since people are already highly motivated to vote in a presidential contest. However, in the 2016 August primary, voters close to a drop box were 3 to 12 percent more likely to vote than were those living several miles away. Drop boxes had the greatest effect in the off-year 2015 election. In the November general election, registered voters who lived near a drop box were 2 to 6 percent more likely to vote, and in the primary, they were 4 to 14 percent more likely. What is it about these drop boxes that motivates people to vote? Is it that they can save the cost of a stamp? We don’t yet know the answer to this question and expect our ongoing research to shed more light on this question. What we do know is that when states switch to voting by mail, as Washington, Oregon and Colorado have now done, the results are unambiguous: more people vote. Our evidence from King County tells us that drop boxes can nudge the numbers up further. So is the new law calling for the installation of more drop boxes across our state one to cheer? The new law has the advantage of being a concrete step to increase turnout. But evidence from King County suggests that increased installations get some populations in some elections to vote. This means that making the best use of drop boxes requires deliberate choices over how many to install and where to put them. On this, the new law is overly prescriptive as it provides counties with little discretion over these decisions. Complying with this new law is also expensive, a noteworthy fact since the state will not provide counties with the funds needed to comply with it. Over the next decade, King County alone will incur over $5 million in expenses to install and manage the new mandated drop boxes. When four out of 10 citizens do not vote for the president, adding drop boxes may reduce, but will not solve, this political problem. Our advice to lawmakers regarding our large nonvoting population is to look first to the evidence to ensure that we address this challenge in the most cost effective way possible.